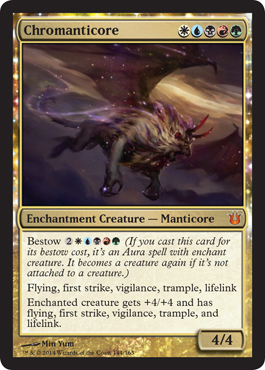 Susceptible to damage easily, but you stop the card draw in control decks. I like it. I... I don't know what to say. It looks really sweet, but... what kind of deck should this go in? I guess I had better get to work with this... Ken Nagle said it pairs with RTR's Chromatic Lantern, I just need to work out a good mix. And that is all Wizards has revealed this morning that I can find... The rest must be coming from other sites and people. This one has been out for a while, but you've probably seen this artwork somewhere... Hint: Richard Wright is the artist. Still can't figure it out? Okay, okay... The art was on the back of a Theros product. I'm still being too vague, aren't I... Well then... By show of hands, how many of you played in the Theros Game Day event? Okay, now how many of you played in the Face the Hydra challenge event? Okay, okay... How many of you bought or were allowed to buy a Face the Hydra challenge deck? By now, some of you have probably knocked over your chair and ran to look for your Face the Hydra deck. Well, look on the back of the folded paper playmat insert. It's a "poster" (honestly, if you plan to use the mat for the challenge, why would you want a poster on the back anyway?) 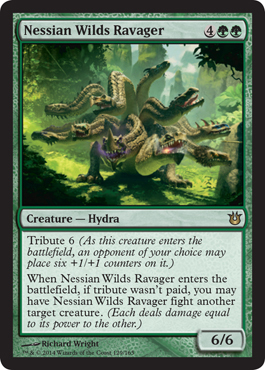 of Nessian Wilds Ravager. That's right, the art wasn't unique and special to this product, it is used on a Born of the Gods card. Clever, huh?